Sunday... for me I know it is definitely going to be a lazy one. I'm in love with everything floral too! The shorts are perfect. And I love the top. And the sunnies. And the bag. Haha, well everything. Oh my gosh, those shorts are so romantic! Looking great - have a lovely Sunday! i've been wanting some floral shorts! yours are killer. Congrats on the new apartment! And I love the shorts. Florals are my thing too. The shorts I've always loved flowers, the bag is spectacular! I love floral print ! floral prints are perfect for summer! Gorgeous, gorgeous shorts! I can't think of a better colour palette to go for spring, they're just lovely. Cute outfit as usual, and congrats on finding a place! these are amazing,i want the same!! I love your shorts and shirt! Yay! The shorts look great on you! Love those sunnies, too! Your shorts are sooooo adorable!! also ur bag! Soooo cute! As always. You always give me inspiration! I really love your outfit :) As usual, it is so well put together. 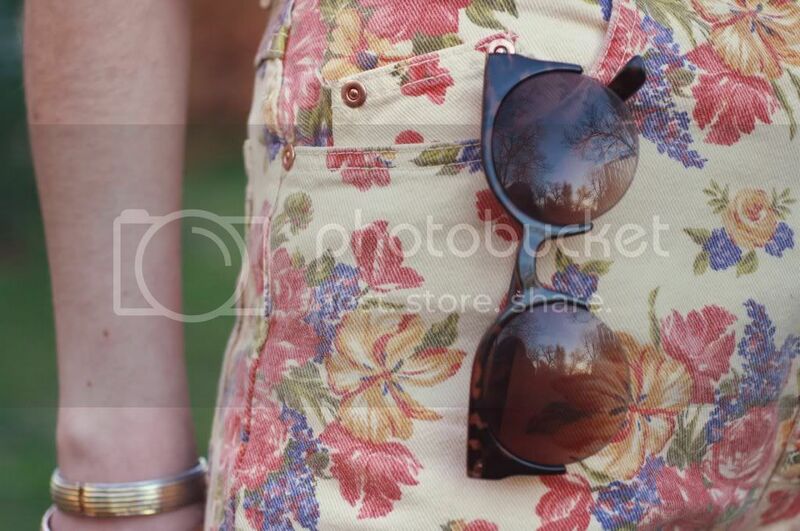 The floral shorts are amazing but what I adore in this outfit are THE GLASSES - what a gorgeous pair. I wish you a super great week ! So pretty! And so excited about your opportunity in Philly! I love that city! I have sunglasses like those! They look adorable on you! And I just wore them today actually! 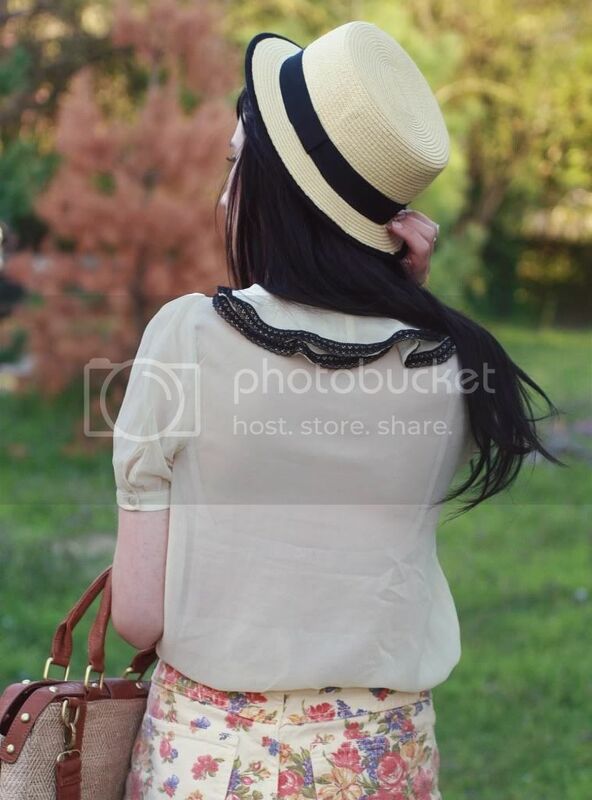 I love the light, airy feeling of your outfit and that hat is absolutely adorable, as is that top! Wow, those shorts are awesome!! Ooo I'd love love to live near a Starbucks, but then I'd need 2 jobs to fund my coffee addiction. I just love the ruffle collar on your blouse. Oh darling, you look sooo good!! Beautiful spring outfit!! Those shorts are super adorable! This is SO CUTE. You are such a doll! I love those shorts! I've seen a lot of floral shorts in the stores lately but I'm particular about the pattern. These are perfect. It must be so nice to be sporting shorts without tights! Love them. Sounds like a great spot in Philly...the coffee and shops are a must! How adorable. Love the shorts! This is now my favourite outfit of yours, so sweet and pretty! I am in loveee with these shorts, and the blouse! Such a cute outfit! :) Have a good week! i love this, especially the shorts and those amazing glasses! you always manage to look seriously perfect! I love anything floral currently so I love the shorts!And the top is very cute too. this it the most perfect sping-ish look ever - i'm absolutely in love with it. Congrats on finding a place my dear! Love the shorts, they go so perfectly with the hat! Omg these shorts are absolutely beautiful! You look very Spring-y indeed!I like how you've given all the pastel-y colours an edge of black. Those shorts are beyond beautiful!!! gorgeous outfit! Love the print on your shorts! Lovely shorts! I haven't worn floral denim since Full house days! I can remember having lots of it, love the fact it's back, you look so pretty and springy! And your sandals are beyond perfection!! Floral jorts: spring for your legs! I love Philly, such a fun and awesome town. Love love love the shorts. I think I'm just about ready to embrace the floral prints.. Which is just as well since they're about the only thing I can find to clothe me in any shop at the moment! :) I love these shorts and your hair is looking gorgeous. Glad you've found a place you like. That's always a great time. Those shorts are gorgeous! Loving this look. The shorts are adorable!!! You look amazing in them. This whole outfit is cute, all the items work so well together. It was great running into you this weekend! And you are so right about the weather - it was lovely!! I adore this outfit. Particularly the sunglasses! these such a pretty short! oh love the color too. your such a doll, I love all your softer girly looks. you look adorable! your shorts are super cute! This outfit is ace. Edwardian schoolgirl on top, nineties Brenda from 90210 on the bottom. So great that you found a place! I adore your style, it's so cute and girly! You've got the best accesories! CUTE! I love the vintage shorts and that bag. PPERFECTION. I'm planning on sewing some floral shorts (cotton) sometime soon, they are perfect for summer. You look amazing! I think those shorts are so gorgeous! I definitely need to get myself a pair of floral shorts. Thrifting here I come!! OMG these shorts were made for you!! They are perfect in every way!! Congrats on your new apartment. You will have to take pics and share with us!! CUTENESS!! love them shorts on u. i am sooo happy you found a place. and the starbucks part is rad. loving the outfit, especially the hat!! nice outfit! i luuuuuurve your shorts! id love a pair like this for summer! wow floral shorts! they are everywhere right now and yours are super cute! i love the way you styled the shorts, what a great find! i have that hat, too, and you've inspired me to wear it :) and congratulations on finding somewhere in philly...i can't wait to read all about your adventures up there! Love the floral shorts! I just thrifted the best pair last week and am so excited to wear them this summer! we have the same hair! your style it's so cute! 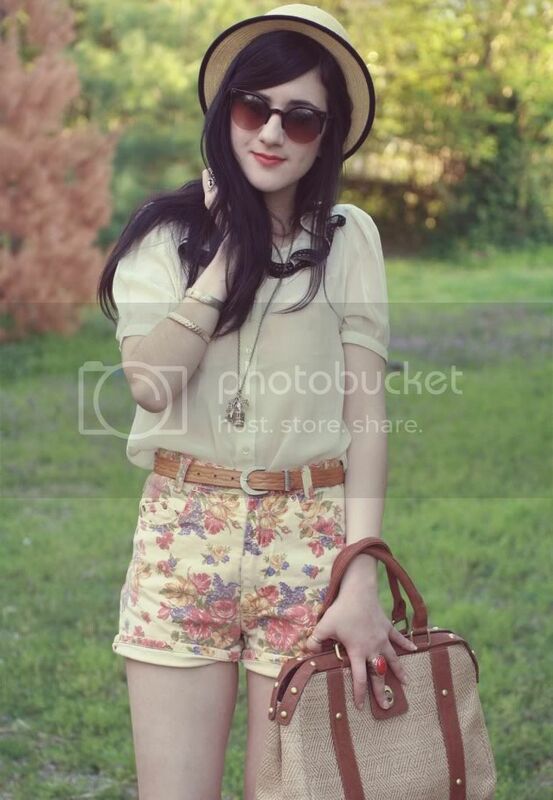 So cute - I love the wedges with the floral shorts. It gives the outfit an edge. I'm in love with this look! Especially the shorts!